From everyone at the Center for the Study of the Drone, we wish you a Happy New Year. An American drone strike in North Waziristan, Pakistan killed three suspected militants. The strike occurred near the town of Miranshah. According to The Guardian, the militants appear to have been of Arab origin and not Pakistani. At Foreign Affairs Magazine, Aaron Stein argues that the proliferation of drones requires new international rules to regulate their use. “The United States should begin to prepare for a world in which it no longer has a monopoly on drone technology,” writes Stein. Ruben Pater, an artist in the Netherlands, has created a “Drone Survival Guide” to help readers identify military drones. The guide, which is printed on aluminum paper, doubles as a reflector to shield the user against infrared drone sensors. The BBC received a tour of the British Royal Air Force’s drone operations at the Waddington air base. This is the first time that the R.A.F has opened its drone operations to the press. At Policy Innovations, David Wilkie and Robert Rose of the Wildlife Conservation Society argue that drones could give conservationists the upper hand in an escalating battle against poachers. Writing for Haaretz, Gili Cohen worries that Israel, the world’s leading exporter of drones, might be losing its dominant standing in the market. Footage that is believed to have been captured by a small drone offers an aerial perspective of the recent protests in Ukraine. At Kernal Magazine, Greg Stevens proposes drones as a solution to the logistical difficulties that Santa Claus faces every Christmas. At Mental Munition blog, Matthew Schroyer recounts his experience with drone mapping. Forbes asks: What makes the quadcopter design so great for small drones? Engineer Yuan Gao answers that it’s because quadcopters are more mechanically simple than single rotor drones. Jeanne Haffner, The View From Above: The Science of Social Space (MIT Press). An exploration of the aerial perspective as it relates to a variety of social science disciplines. Richard Overy, The Bombing War: Europe 1939-1945 (Allen Lane). A history of the controversial bombing practices of the Second World War. Peter Adey, Mark Whitehead and Alison Williams, eds., From Above: War, Violence and Verticality (Oxford University Press). A multidisciplinary collection of studies on the aerial perspective. William Dalrymple, Return of the King: The Battle for Afghanistan, 1839-1842 (Knopf). An account of the failed British invasion of Afghanistan in the 19th century. Richard Holmes, Falling Upwards: How We Took to the Air (Pantheon). A history of the early years of ballooning. 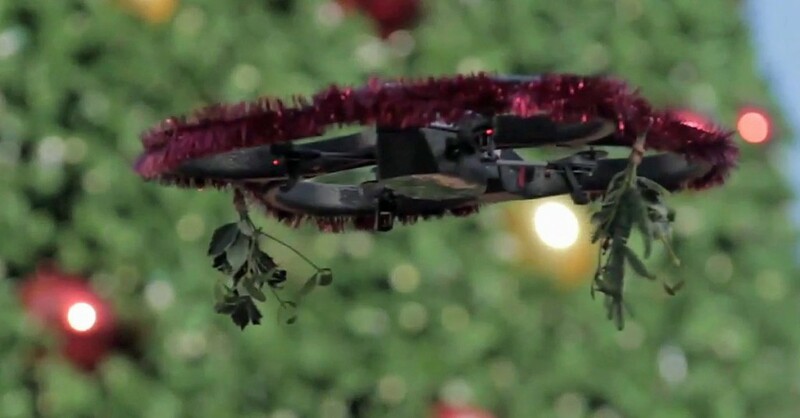 Photo: The mistletoe drone as conceived by artists George Zisiadis and Mustafa Khan.